From Macomb, Michigan, Brianna Seymour (on right) was the only member of the 2018 Region 4 hunter seat Region Champion Michigan State team to qualify for 2018 Nationals. Seymour won the individual walk-trot-canter class at Zone 6 Zones in Westerville, Ohio on April 7th to continue on to the Pennsylvania Farm Show Complex in Harrisburg, Pennsylvania. 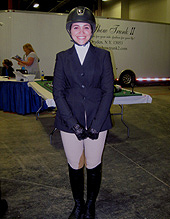 At Nationals Seymour earned the top undergraduate ribbon for any Region 4 rider entered. 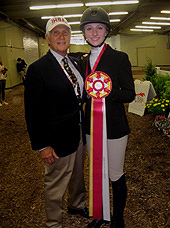 Seymour poses with IHSA Founder and Executive Director Bob Cacchione after receiving second place in individual walk-trot-canter in Harrisburg on May 3rd. Her older sister Katie had represented Region 4 at 2015 and 2016 IHSA Nationals in the Cacchione Cup Competition and in 2018 it was her turn. Emily Stewart of Western Michigan University (pictured) was the hunter seat rider with the most combined open flat and fences points within Region 4 during the 2017-18 season. Unlike her older sister Emily had to compete in and place inside the top three in a Cacchione class at Zones in order to continue on to Nationals. Emily excelled at Zones, winning the Cacchione class outright. 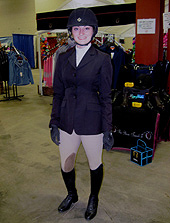 She is seen here at the Pennsylvania Farm Show Complex awaiting horse draw for the jumping phase of the Cacchione Cup Competition on May 4th. While Emily Stewart was the region's top hunter seat rider Brooke Viele of Albion College (on right) was the region's top western rider last season. From Midland, Michigan Viele received the most combined open reining and open horsemanship points. She is seen here with Albion western coach Nathan Horsman after drawing for the horsemanship phase of the individual AQHA High Point Open Rider Competition at the Pennsylvania Farm Show Complex on May 5th. When Sarah Dooreleyers won the individual intermediate over fences division at Zone 6 Zones on the campus of Otterbein University last April 7th she became the first University of Western Ontario rider to qualify for an IHSA Nationals event in three years. From Nairn, Ontario Dooreleyers is seen here in the vendor area underneath the stands at the Pennsylvania Farm Show Complex last May 3rd before riding in the same division at Nationals a short time later. Schools competing in Zone 6, Region 4 during the 2018-2019 school year: Albion College, Alma College, Calvin College, Central Michigan University, Ferris State University, Grand Valley State University, Kalamazoo College, Michigan State University, Oakland University, Saginaw Valley State University, University of Michigan, University of Western Ontario, Wayne State University and Western Michigan University.